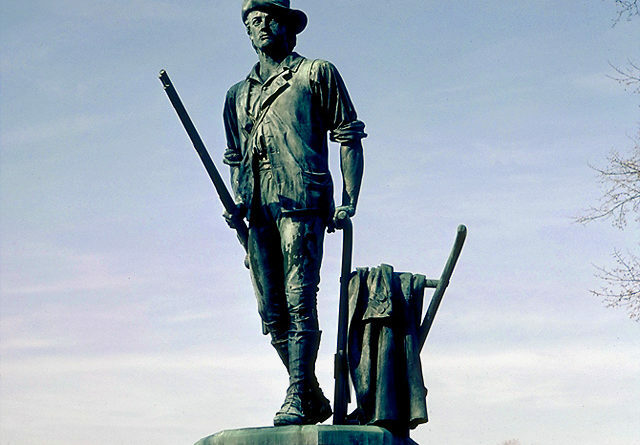 "The Minute Man" statue by Daniel Chester French in Concord, Massachusetts, which depicts Isaac Davis, a gunsmith and militia officer who commanded a company of Minutemen from Acton, Massachusetts, during the first battle of the American Revolutionary War. The British met little resistance on their way to Concord, though the 70 Minutemen who waited at Lexington on the morning of April 19 would prove to be able fighters later. The colonists at Lexington had the good sense to disperse after seeing the overwhelming number of redcoats — but not before one of their number, or perhaps a British soldier, fired the shot heard round the world, and the war was on.